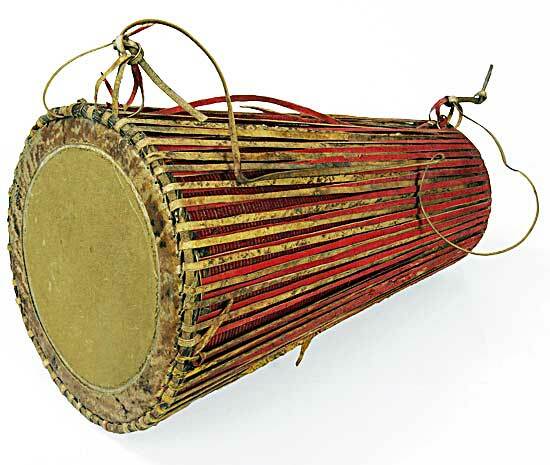 This folk drum is an essential accompaniment for tribal dances. The Santals call it Tumdak or Tumdah. About 60 cm in length and slightly conical in shape, the wider end having a diameter of about 30 cm, the hollow body is made from burnt clay. To reinforce the clay surface, strips of leather, cloth, cane or even plastic (nowadays) are wrapped tightly around the body, covering the entire clay surface. The two open ends of unequal diameter are covered with animal hide, attached to a strong leather ring mounted on each rim of the drum. The two surfaces are kept taut with the help of narrow strips of leather tightly laced vertically across the body, connecting the two leather rings. The smaller right side produces a high pitched sound while the larger left side makes a deep bass sound. The resonance is accentuated or lowered by treating the face with a black circle of tuning paste made up of rice paste, glue, and iron filings. 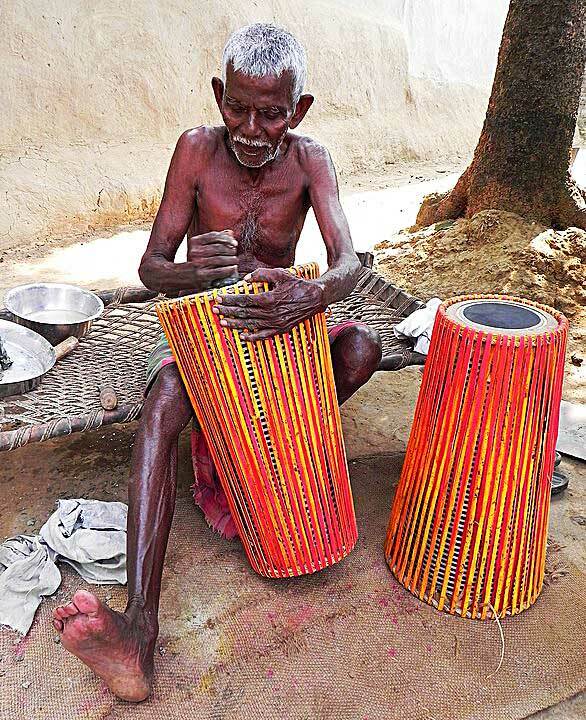 Played with both hands, the player suspends the drum around his neck with a cord or leather strap.